David Jeffrey. Pic by PressEye Ltd.
Ballymena United manager David Jeffrey has issued a challenge to his players entering the Christmas run of fixtures. 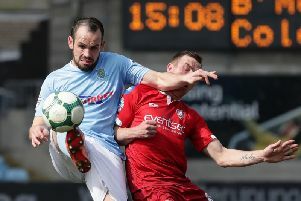 Success on Saturday by 2-0 over Portadown helped United bounce back from back-to-back Danske Bank Premiership defeats. Now Jeffrey is preparing his players for a trip to Glentoran this weekend. “We keep saying to the players, keep understanding you’ve got to make a contribution and now, coming up to Christmas and the transfer window, we ask each player to reflect,” said Jeffrey. “We’ve now got 33 points and 40 was our total last year. “It’s one game at a time but we are just enjoying the journey to see where it takes us. “Glentoran are building up a head of steam and you’ve got to say Gary Haveron has come in and done a superb job, with the players really responding. “Gary’s bright, keen and very enthusiastic and I admired his work down at Carrick Rangers. “Now he has an opportunity at one of the biggest clubs in the league so next week will be a real test for us. Jeffrey was pleased with the players’ persistence against Portadown. “Obviously Portadown were coming off the back of a disappointing result last week,” said Jeffrey. “But you look at some of the players in that team, players like Keith O’Hara, Garry Breen, Robert Garrett and Tim Mouncey, players with real integrity, so there’s no way it was going to be an easy game. “The first half was even-stevens, a nearly half - we nearly got the ball through, we nearly got the pass, we nearly got the header but we didn’t do anything to be fair apart from a couple of chances. “What’s pleasing is how the players keep going, we try to take off as much pressure as possible off their shoulders and say go and play. “In the first half the pass was over-played or under-hit and not making the ball stick, playing into Portadown’s strengths.